Ever been in a position where you have something important to do for yourself but you keep doing everything else to avoid doing it? That’s something I constantly have to fight through in order to get certain things done, like writing a blog post, organizing an event, painting an idea, starting or finishing a project, exercising regularly and even writing this. Why? What is fear anyway? Is it rational? Can it really hold you back or did you decide to give it the power to hold you back? I was listening to an interview with artist Ann Rea a little while ago and she was talking about a friend she used to work with and who was a cancer survivor. Her friend dreamed of becoming an interior decorator but was working a soul sucking office job instead. She had no debts, no kids and a supporting husband but for some reason she was more afraid of starting a new career in a field she loved than to go through chemotherapy. She died unfortunately without ever giving herself a chance to at least try. This was a wake up call for Ann Rea who decided to turn her own dream into reality. She quit her job, moved to her dream city and started earning more money doing what she loves: painting. Now she also coaches other artists on how to thrive while doing what they love. She faced her fear and came out the other side a better and stronger person. If you don’t take the time to really face your fears and to evaluate them, chances are you’ll perceive them as being much bigger than they need to be. Think about something you've been dreaming about but have been avoiding out of fear. Now think about one of the worst things that has happened in your life. Is your current fear of something that could happen worst than what already happened? I'll guess it's probably not. Not only did it happened, but you faced the worst and you survived. Chances are you’re probably stronger because of it. So could it be that you’ve been giving that fear a little too much power over you and that by going ahead anyway, you’ll find out that you are stronger than you think you are? No matter what the outcome is, you’ll learn something and grow. As far as I know, no one ever regrets facing their fears in the long run. Fear will never go away. It’s part of the process. 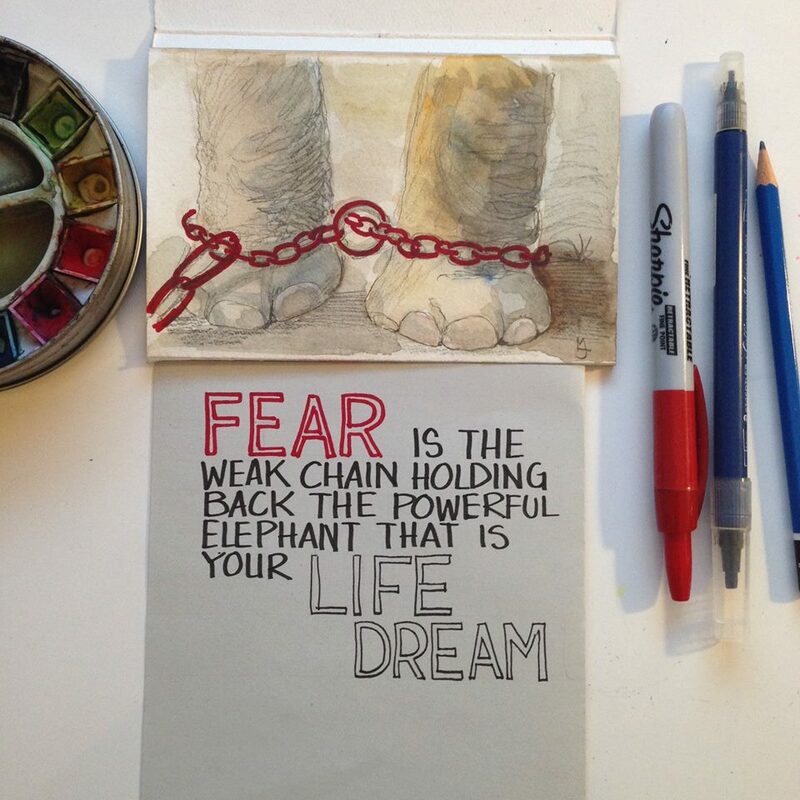 However, the more you take action, the smaller your fear becomes and the more powerful you'll feel. I used to be scared of driving alone across the border but when an opportunity for a sketching event came up, I started to think about it a little bit more rationally because I really wanted to go. So I thought “What exactly am I afraid of? I have a cell phone if I get lost. There are road signs along the way. I can prepare and see the entire trip on Google map before going. I speak English. Many people will be going as well. It’s not like if it’s in the middle of nowhere”. I really was running out of reasons to be afraid. So I went. I drove 5 hours to Ithaca, New York by myself. My first solo drive across the border and the longest I’ve ever driven to date. And yes, I felt very empowered once I conquered my fear. Now it doesn’t seem like such a big deal anymore because I took action. Not only that, I met a lot of great people and learned a lot of new sketching tricks. I’m even thinking about doing it again this year. Fear keeps you from moving forward only because you think it’s stronger than you, not because it is. What fear are you willing to face and conquer this month?